If you’re a fan of Alfred Hitchcock and physical comedy, then the fast-paced, witty and irreverent retelling of The 39 Steps, currently at Langham Court Theatre (until March 23rd) is sure to appeal. Written in 2005 by Patrick Barlow as an adaptation of Hitchcock’s classic thriller (itself adapted from the 1910 novel by John Buchan) it is a veritable tour-de-force for the small group of four actors who play over 100 roles between them. Only Alan Penty (Richard Hannay) plays a single character. Theatre-goers accustomed to the rich and lavish productions staged at Langham will initially be surprised by the stark stage, and minimal props, employed to suggest everything from a box at the Palladium to a moving train, a hotel on the moors to a lavish country home. Projections (Kevin Stinson) add significantly to creating the ambiance of the many environments. 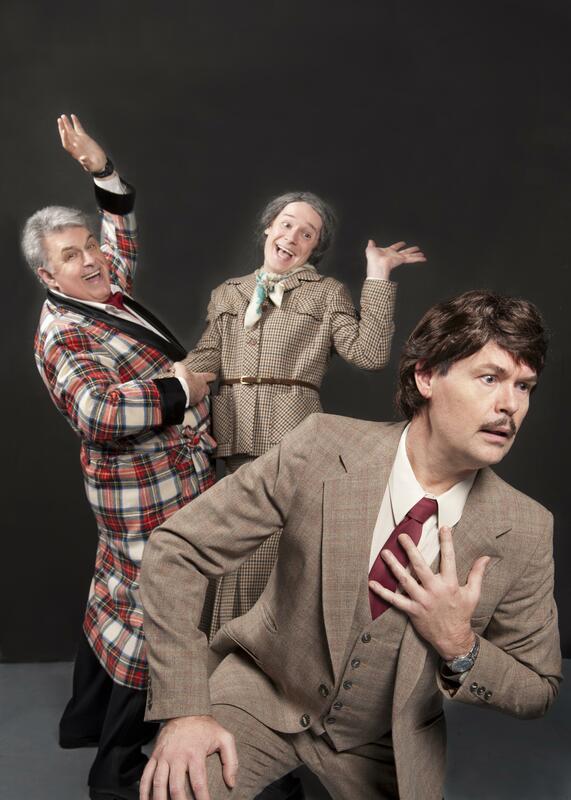 It takes considerable talent to be zany without tipping into sheer foolishness – a tightrope these actors negotiate with care. Alan Penty (Richard Hannay) and Karen Brelsford (Annabella/Margaret/Pamela) have appeared together for the past three seasons in Sin City, the Live Improvised Serial – the synergy and comedic timing they have honed is evident in every one of their scenes together. From murder to encounters on the train – the faultless transitions will have you gasping with laughter. Toshik Bukowiecki (Clown 1) was coaxed out of “retirement”; in the past few years he’s directed and designed shows, but his last appearance as an actor at Langham was in 2005 as Harry in Timothy Findley’s The Stillborn Lover. What a return it is – of particular note were scenes as Mrs McBates, owner of the afore-mentioned hotel, and the chase scenes (with Nick Sepi – Clown 2) where the two actors alternated, with seconds between character changes, as the cops and the villains. Sepi (last seen in The Foreigner) shines in his cross-dressing role as Mrs Jordan. In addition to rapid-fire costume and scene changes, the actors must differentiate dialects – everything from London English, Cockney, broad Scots and even German. I was most impressed by this work – there is no mention of a dialects coach in the program, but if there was one, they deserve kudos. Look for Hannay being chased through the crowd of kilt-wearing pipers, and his daring escape from the train on the Fourth Bridge for fine examples of low-tech special effects employed to their utmost. Bill Adams, in his final set design for Langham Court, will be missed! He’s employed the turning stage for some of the most outrageous scenes. The script is full of winks and nudges, not the least of all to Hitchcock’s many hit thrillers: Psycho, North by Northwest, Vertigo – but it is not essential to be familiar with his work. 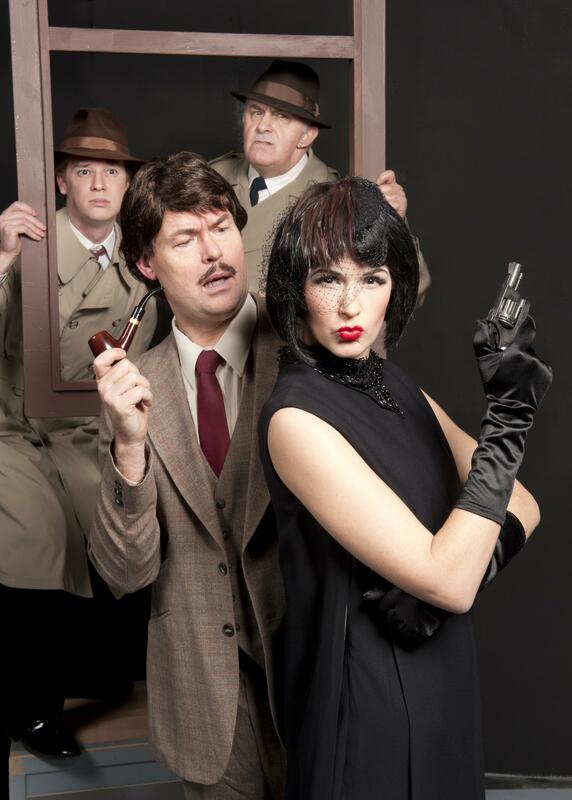 The 39 Steps takes the best of British music-hall, vaudeville, and farce and combines it for an evening of over-the-top old-fashioned fun; all this, and laughs galore. What great entertainment. Let your cares slide away and indulge in some merriment. Ticket sales are very brisk – the run may be extended. More details will be provided as they are available. Disclaimer: I was provided with tickets to the opening night of That Face, and asked to provide a review. As always, I retain full editorial control over all content published on my blog. Lady Windemere’s Fan at Langham Court Theatre. A review.